Gothenburg Roller Derby brings home a double win! Last Saturday The A-Team and the Badass Beavers travelled to Norway to meet the A- and B-team of Oslo Roller Derby. 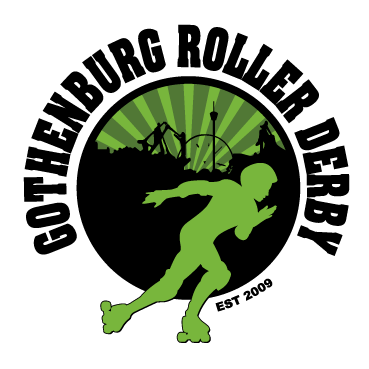 For the first game The A-Team met Oslo Roller Derby A. Both teams started out strong, putting up slow moving walls against some really strong jammers. The A-Team managed to contain the Oslo jammers successfully through out the first period, taking the lead and getting that score difference to keep growing. Halftime scores read 55-119 in favour of The A-Team. Oslo Roller Derby A stepped up their game for the second period and started to catch up to The A-Team and keeping everyone on their toes. However, The A-Team kept the lead through out the game . Final score ended at 131-164 in favour of The A-Team, marking yet another win for this season. This was the second WFTDA sanctioned game for the league, getting us closer to a WFTDA ranking. We congratulate the team who are now preparing for their next game at the weekend of the Elite League of Roller Derby, 28-29 November. The Badass Beavers met Oslo Tiger City Beasts in the second game of the day. The Badass Beavers took lead first jam showing some great offence play. The teams played a really close game with several lead changes through out the game. By the end of the first period, Oslo Tiger City Beasts had the lead with scores reading 77-63. The second period showed to be even more exciting. Oslo Tiger City Beasts kept the lead through out the bigger part of the period, with the Badass Beavers in hot pursuit. After a chaotic last jam, keeping everyone at the edge of their seat, the Badass Beavers won the game by four points, leaving the final score at 176-180. We congratulate the team on their first win this season, showing us they have really come far through hard work. They now prepare for their next game against Dock City Rollers Plan B, 19th December. We also want to thank Oslo Roller Derby for being amazing hosts, we had a great time! This past Saturday Gothenburg Roller Derby hosted a doubleheader where The A-Team met Hulls Angels Roller Dames and The Badass Beavers met Uppsala Roller derby – Jackdaw City Rollers. First out was The A-Team against Hulls Angels Roller Dames. The A-Team took the lead in the first jam, and scored the first points of the day in the second jam. They performed strong walls and synchronised offences, getting their jammers out quickly. Hulls Angels kept their walls tight and slow, and covered the track efficiently. Hulls Angels couldn’t match The A-Team, leaving the halftime score at 188-35 in favour of The A-Team. The A-Team kept playing a strong game through out the second period, with a steady growing score difference. Hulls Angels picked up their game, but could not catch up to The A-Team, who kept the lead the entire game. The final score ended at 361-85 in favour of The A-Team. In January The A-Team where ranked 129 on the European Flat Track Stats Ranking. With this game The A-Team has climbed and are now ranked 50th, showing that all the hard work has paid off for the team. The Badass Beavers started in the second game against Uppsala Roller Derby – Jackdaw City Rollers. It was an exciting game from the first jam, where Jackdaw earned lead jammer but which soon shifted to a power jam in favour of The Badass Beavers. It was an even game where the Badass Beavers kept the lead 20 minutes into the first period, then the lead changed. At halftime Jackdaw City Rollers had the lead with the scores reading 126-109. For the second period, the teams continued to play an exciting game with lots of hard hitting blockers and lateral jammers. The Badass Beavers could not catch up to Jackdaw City Rollers, and the game ended 187-239 in favour of Jackdaw City Rollers. This was The Badass Beavers second game together this season, and they already show a lot of progress since their first game in Ludwigsburg a few weeks ago. We would like to thank Hulls Angels Roller Derby and Jackdaw City Rollers for two great games and wish them well in their upcoming games. Gothenburg Roller Derbys both teams are now preparing to meet Oslo Roller Derby and Tiger City Beasts. Come cheer for us on 7th November this Saturday in Oslo, you’ll find everything you need in their event here.